In the automotive industry, alloy wheels are wheels that are made from an alloy of aluminium or magnesium. Alloys are mixtures of a metal and other elements. They generally provide greater strength over pure metals, which are usually much softer and more ductile. Alloys of aluminium or magnesium are typically lighter for the same strength, provide better heat conduction, and often produce improved cosmetic appearance over steel wheels. Although steel, the most common material used in wheel production, is an alloy of iron and carbon, the term "alloy wheel" is usually reserved for wheels made from nonferrous alloys. The earliest light-alloy wheels were made of magnesium alloys. Although they lost favor on common vehicles, they remained popular through the 1960s, albeit in very limited numbers. In the mid-to-late 1960s, aluminium-casting refinements allowed the manufacture of safer wheels that were not as brittle. Until this time, most aluminium wheels suffered from low ductility, usually ranging from 2-3% elongation. Because light-alloy wheels at the time were often made of magnesium (often referred to as "mags"), these early wheel failures were later attributed to magnesium's low ductility, when in many instances these wheels were poorly cast aluminium alloy wheels. Once these aluminium casting improvements were more widely adopted, the aluminium wheel took the place of magnesium as low cost, high-performance wheels for motorsports. Alcoa's heavy-duty alloy wheel, for buses and trucks. Lighter wheels can improve handling by reducing unsprung mass, allowing suspension to follow the terrain more closely and thus improve grip, however not all alloy wheels are lighter than their steel equivalents. Reduction in overall vehicle mass can also help to reduce fuel consumption. Better heat conduction and a more open wheel design can help dissipate heat from the brakes, which improves braking performance in more demanding driving conditions and reduces the chance of diminished brake performance or even failure due to overheating. Alloy wheels are also purchased for cosmetic purposes although the cheaper alloys used are usually not corrosion-resistant. Alloys allow the use of attractive bare-metal finishes, but these need to be sealed with paint or wheel covers. Even if so protected the wheels in use will eventually start to corrode after 3 to 5 years but refurbishment is now widely available at a cost. The manufacturing processes also allow intricate, bold designs. 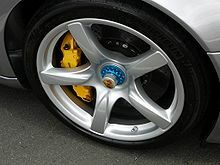 In contrast, steel wheels are usually pressed from sheet metal, and then welded together (often leaving unsightly bumps) and must be painted to avoid corrosion and/or hidden with wheel covers/hub caps. Alloy wheels are prone to galvanic corrosion, which can cause the tires to leak air if appropriate preventive measures are not taken. Also, alloy wheels are more difficult to repair than steel wheels when bent, but their higher price usually makes repairs cheaper than replacement. Alloy wheels are more expensive to produce than standard steel wheels, and thus are often not included as standard equipment, instead being marketed as optional add-ons or as part of a more expensive trim package. However, alloy wheels have become considerably more common since 2000, now being offered on economy and subcompact cars, compared to a decade earlier where alloy wheels were often not factory options on inexpensive vehicles. Alloy wheels have long been included as standard equipment on higher-priced luxury or sports cars, with larger-sized or "exclusive" alloy wheels being options. The high cost of alloy wheels makes them attractive to thieves; to counter this, automakers and dealers often use locking lug nuts or bolts which require a special key to remove. Most alloy wheels are manufactured using casting, but some are forged. Forged wheels are usually lighter, stronger, but much more expensive than cast wheels. There are two types of forged wheels: one piece and modular. Modular forged wheels may feature two- or three-piece design. Typical multi-piece wheels consist of the inner rim base, outer rim lip and wheel center piece with openings for lug nuts. All parts of a modular wheel are held with bolts. 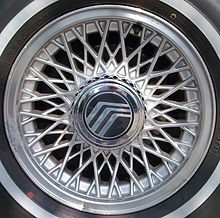 BBS RS is one of the most famous three-piece modular forged wheels. A sizable selection of alloy wheels are available to automobile owners who want lighter, more visually appealing, rarer, and/or larger wheels on their cars. Although replacing standard steel wheel and tire combinations with lighter alloy wheels and potentially lower profile tires can result in increased performance and handling, this doesn't necessarily hold when increasingly large wheels are employed. Research by Car and Driver conducted using a selection of differently sized alloy wheels from 16 to 19 in (41 to 48 cm) all outfitted with the same make and model of tires showed that both acceleration and fuel economy suffered with larger wheels. They also noted that ride comfort and noise were negatively affected by the larger wheels. 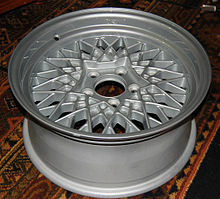 Most aftermarket wheels are cast, while only a few above are forged, such as Donz, Vellano and Weld. Many companies have been formed over the years (some recently) due to the rising demand for larger diameter wheels. The demand for larger wheels was spurred on by the invention of wheel spinners by American Tru-Spinners. The original U.S. patent #5,290,094 that was invented by the founder of American Tru-Spinners James JD Gragg that licensed several wheel manufacturers and manufactured their own series of spinner wheels that were one-piece integral spinner wheels and some adaptable spinner wheels to where the center of the wheel continues spinning after the vehicle comes to a stop. American Tru-Spinners also invented another series of wheel spinners that spun backwards while the wheel traveled forwards and some traveled in a stationary position focusing on the wheel manufacturer logo staying level while in motion utilizing specialized bearings. American Tru-Spinners also introduced the use of Holograms in the spinner wheels that gave a lighted strobe effect without the use of a battery or electric source. American Racing, which owns Motegi Racing among other brands such as TIS, TIS Modular, is the oldest aftermarket wheel company dating back to 1956. The oldest British company is Wolfrace which was the first company to offer a polished alloy wheel in Europe and to achieve TÜV approval. Wolfrace also provided the wheels for Thrust SSC and the UK's land speed record bid. A recent trend in the industry includes joint venture partnerships being formed between offshore manufacturers and local importers/distributors such as PDW Wheels which started in Australia in 2006, amongst a few others. Some "aftermarket" are/were also available as original equipment manufacturer (OEM) fitments, with BBS being a notable original equipment supplier to Volkswagen. Some manufacturers also share patterns and castings, with an example (motorcycle) being the licensing of Marchesini five-spoke design to Brembo, for the production of alloy (non-magnesium) wheels for Ducati road bikes. Magnesium alloy wheels were the first die-cast wheels produced, and were often referred to as simply "mag wheels." Magnesium wheels were originally used for racing, but their popularity during the 1960s led to the development of other die-cast wheels, particularly of aluminium alloys. The term "mag wheels" became synonymous with die-cast wheels made from any material, from modern aluminium alloy wheels to plastic and composite wheels used on items like bicycles, wheelchairs, and skateboards. However, pure magnesium wheels are no longer produced, being found only on classic cars. Pure magnesium suffers from many problems. Vintage magnesium rims were very susceptible to pitting, cracking and corrosion. Magnesium in bulk is hard to ignite but pure magnesium wheels can be ignited by a burning tire or by prolonged scraping of the wheel on the road surface following a puncture. Alloys of magnesium were later developed to alleviate most of these problems. In fact, US Federal Aviation Administration has conducted wide-ranging tests over the past decade, and has reached a conclusion that potential flammability of magnesium is no longer deemed to be a concern. Modern surface treatment technologies provide protection from corrosion and significantly extend the average lifecycle of magnesium rims. The mass of a typical magnesium automotive wheel is about 5–9 kg (11–20 lb) (depending on size). Forging can be done by a one or multi-step process forging from various magnesium alloys, most commonly AZ80, ZK60 (MA14 in Russia). Wheels produced by this method are usually of higher toughness and ductility than aluminium wheels, although the costs are much higher. Forging is a complicated process that involves such processes, as heating, rolling, applying high pressure, hammering and/or combination of these . As a result, the molecular structure of the alloy changes, and as a result the material becomes stronger and more lightweight. That’s the way manufacturers of aftermarket wheels make their products. There are one- two- and 3-piece forged wheels. Every piece is originally an alloy billet, which is further transformed into a wheel, in cases of one-piece forged wheels, or into a wheel part in cases of multi-piece wheels. This process uses a die arranged in a large machine that has high closing force to clamp the die closed. The molten magnesium is poured into a filler tube called a shot sleeve. A piston pushes the metal into the die with high speed and pressure, the magnesium solidifies and the die is opened and the wheel is released. Wheels produced by this method can offer reductions in price and improvements in corrosion resistance but they are less ductile and of lower strength due to the nature of HPDC. This process usually employs a steel die, it is arranged above the crucible filled with molten magnesium. Most commonly the crucible is sealed against the die and pressurized air/cover gas mix is used to force the molten metal up a straw-like filler tube into the die. When processed using best practice methods LPDC wheels can offer improvements in ductility over magnesium wheels and any cast aluminium wheels, they remain less ductile than forged magnesium. Gravity-cast magnesium wheels have been in production since the early 1920s and provide good ductility, and relative properties above what can be made with aluminium casting. Tooling costs for gravity-cast wheels are among the cheapest of any process. This has allowed small batch production, flexibility in design and short development time. ^ Brad Bowling (27 Feb 2004). Complete Wheel and Tire Buyer's Guide. KP Books. p. 95. ISBN 978-0873496612. ^ "Effects of Upsized Wheels and Tires Tested - Tech Dept. - Auto Reviews". Car and Driver. Retrieved 2011-08-08. ^ "Evaluating the Flammability of Various Magnesium Alloys During Laboratory- and Full-Scale Aircraft Fire Tests" (PDF). Federal Aviation Administration. ^ "Wheelweights.Net". Wheelweights.Net. Archived from the original on 24 July 2011. Retrieved 2011-08-08. ^ "What is Forging?". Thomasnet.com. April 2018. 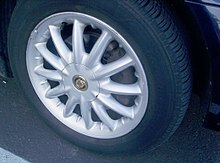 Wikimedia Commons has media related to Alloy wheels. This page was last edited on 1 February 2019, at 08:03 (UTC).